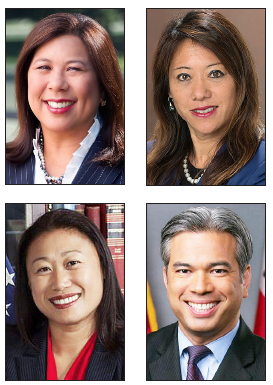 Asian American candidates made their mark in statewide and legislative races in California on Nov. 6. State Controller: Democratic incumbent Betty Yee was re-elected with 5,316,570 votes (63.8 percent) to Republican Konstantinos Roditis’ 3,023,106 (36.2 percent). Yee, who has been in office since 2015, previously served as a member of the California Board of Equalization. State Treasurer: Democrat Fiona Ma defeated Republican Greg Conlon, 5,167,552 (62.2 percent) to 3,145,531 (37.8 percent), to succeed Democrat John Chiang, who unsuccessfully ran for governor. Ma previously served on the Board of Equalization, in the Assembly, and on the San Francisco Board of Supervisors. Senate District 4: Democratic challenger Phillip Kim finished well behind Republican incumbent James Nielsen, 91,588 (41.6 percent) to 128,701 (58.4 percent). Kim is a community organizer. Senate District 6: Democratic incumbent Dr. Richard Pan was re-elected with 103,826 votes (68.8 percent) to no-party-preference candidate Eric Frame’s 47,168 (31.2 percent). Pan, who has been in office since 2014, previously served in the Assembly. Senate District 22: In a contest between two Democrats, Mike Eng finished behind Susan Rubio, 65,042 votes (47.7 percent) to 71,323 (52.3 percent). Eng, a former mayor of Monterey Park, previously served in the Assembly and on the Los Angeles Community College District Board of Trustees. The Senate seat is currently held by Democrat Ed Hernandez, who unsuccessfully ran for lieutenant governor. Senate District 24: In a contest between two Democrats, Peter Choi finished far behind Maria Elena Durazo, 46,400 (33.2 percent) to 93,198 (66.8 percent). Choi, who is president and CEO of the Temple City Chamber of Commerce, previously ran in 2014. The Senate seat is currently held by Democrat Kevin de Leon, who unsuccessfully ran for U.S. Senate. Senate District 34: The incumbent, Janet Nguyen (R-Garden Grove), retained her seat with 97,717 votes (52.1 percent) to Democrat Tom Umberg’s 89,864 (47.9 percent). First elected in 2014, Nguyen previously served on the Orange County Board of Supervisors. She is the first Vietnamese American to be elected to a state senate. Assembly District 9: Harry He lost to a fellow Democrat, incumbent Jim Cooper of Elk Grove, 20,792 votes (30.7 percent) to 46,929 (69.3 percent). He is an information technology manager for People Supermarket Inc. Assembly District 17: Incumbent David Chiu (D-San Francisco) defeated fellow Democrat Alejandro Fernandez, 124,265 (76.7 percent) to 37,728 (23.3 percent). Chiu, who has been in office since 2014, was previously president of the San Francisco Board of Supervisors. Assembly District 18: Incumbent Rob Bonta (D-Oakland) defeated Republican Stephen Slauson, 104,688 (88.3 percent) to 13,935 (11.7 percent). Bonta, who has been in office since 2012, chairs the Asian Pacific Islander Legislative Caucus and was the first Filipino American elected to the Legislature. Assembly District 19: Incumbent Phil Ting (D-San Francisco) defeated Republican Keith Bogdon, 120,831 (83.5 percent) to 23,961 (16.5 percent). Ting has been in office since 2012 and was previously assessor-recorder of San Francisco. Assembly District 25: Incumbent Kansen Chu (D-San Jose) defeated Republican Bob Brunton, 74,738 (73.6 percent) to 26,829 (26.4 percent). Chu, who has been in office since 2014, previously served on the San Jose City Council. Assembly District 27: Incumbent Ash Kalra (D-San Jose) defeated Republican G. Burt Lancaster, 66,509 (75.1 percent) to 22,001 (24.9 percent). Kalra, who has been in office since 2016, previously served on the San Jose City Council. He is the first Indian American to serve in the Legislature. Assembly District 28: Incumbent Evan Low (D-Campbell) defeated Republican Michael Snyder, 97,133 (70.4 percent) to 40,869 (29.6 percent). Low has been in office since 2014 and previously served as mayor of Campbell. Assembly District 34: Incumbent Vince Fong (R-Bakersfield) defeated Democrat Nick Nicita, 96,386 (71.5 percent) to 38,406 (28.5 percent). Fong has been in office since 2016 and was previously district director for U.S. House Majority Leader Kevin McCarthy. Assembly District 46: Incumbent Adrin Nazarian (D-Van Nuys) was re-elected, defeating Republican Roxanne Beckford Hoge, 103,763 votes (97.1 percent) to 27,356 (20.9 percent). Nazarian, who has been in office since 2012, is the first Iranian American elected to the Legislature. Assembly District 49: Incumbent Ed Chau (D-Monterey Park) was re-elected, defeating Republican Burton Brink, 51,962 (69.1 percent) to 23,258 (30.9 percent). Chau has been in office since 2012 and was previously a trustee of the Montebello Unified School District. Assembly District 53: Challenger Kevin Hee Young Jang, an attorney and a Democrat, lost to incumbent Miguel Santiago (D-Los Angeles), 37,429 (70.8 percent) to 15,415 (29.2 percent). Assembly District 55: Incumbent Phillip Chen (R-Brea) defeated Democrat Gregg Fritchle, 65,629 (56.7 percent) to 50,071 (43.3 percent). Chen has been in office since 2016 and was previously a trustee of the Walnut Valley Unified School District. Assembly District 66: Incumbent Al Muratsuchi (D-Torrance) defeated Republican Frank Scotto, 76,664 (58.2 percent) to 55,138 (41.8 percent). Muratsuchi was first elected in 2012, lost the seat in 2014, and regained it in 2016. Assembly District 68: Incumbent Steven Choi (R-Irvine) defeated Democrat Michelle Duman, 72,083 (55.3 percent) to 58,275 (44.7 percent). Choi has been in office since 2016 and was previously mayor of Irvine. Assembly District 72: Republican Tyler Diep, a member of the Westminster City Council, beat Democrat Josh Lowenthal, 62,363 (53.3 percent) to 54,736 (46.7 percent). Diep will succeed Republican Travis Allen, who unsuccessfully ran for governor. Assembly District 78: Incumbent Todd Gloria (D-San Diego), who has been in office since 2016, was re-elected with 128,483 votes (71 percent) to Republican Maggie Campbell’s 52,601 (29 percent). Previously a member of the San Diego City Council who served as interim mayor during his tenure, Gloria is only the second person of Filipino heritage elected to the Assembly and the Legislature’s only enrolled tribal member.